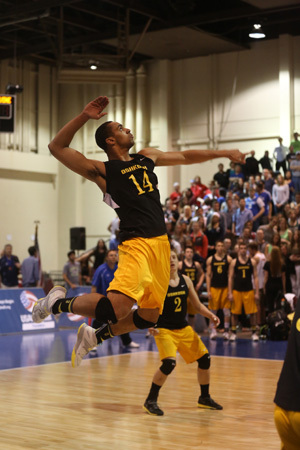 The UW-Oshkosh II men's volleyball team won its second National Collegiate Volleyball Federation Division III national title over three days (April 5-7) in Kansas City, Mo. With the title, the Titans have now won six collegiate club national titles, three in Division I (2006, 2007 & 2011), one in Division II (1996) and two in Division III (2010 & 2012). The Titans (40-4) started the 24-team tournament as the overall second seed and in a pool with San Jose State University II, University of Southern California II and Indiana University II. UW-Oshkosh II dominated San Jose State University II 25-18, 25-12 and University of Southern California II, 25-14, 25-17 before falling to Indiana University II, 30-28, 17-25, 15-13 to capture second in their pool to the Hoosiers. The Titans were led in the opening match on Thursday (April 5) by Brandon Wagner (Fr. - Mukwonago) with nine kills on 13 errorless attempts and Will Brydon (Sr. - Northbrook, Ill.) with seven kills on nine attempts. Bob Hall (Jr. - Appleton) dished out 21 assists, Steve Brunelli (Sr. - Greenfield) added four digs and three blocks and Wagner had three blocks. Wagner had six kills and four blocks against the Trojans. Hall provided 19 assists and three digs, Tyler Wiedenhoeft (Fr. - Mequon) tallied five digs and three service aces and Matt Maciejewski (Sr. - Greenfield) slammed down five kills. Against the Hoosiers, Maciejewski had 10 kills, Andrew Nett (Sr. - Fond du Lac) nine kills and six blocks and Wagner tallied eight kills and five blocks. Hall registered 29 assists and eight digs, Wiedenhoeft scooped up nine digs and Brydon had five blocks. Because they finished second in their pool, the Titans had to defeat the University of Texas II to have a chance to advance to the gold bracket of the tournament. UW-Oshkosh II responded by dominating the Longhorns, 25-18, 25-15. Maciejewski led UW-Oshkosh II with six kills and three service aces and Hall had 18 assists. Nett collected three blocks, Brydon five kills and Wiedenhoeft amassed three digs. With the win UW-Oshkosh II advanced to a power pool with Big Ten Conference foes University of Wisconsin II and the University of Illinois II. In their first match the Titans swept the Badgers, 25-16, 25-21 and advanced to the Gold Bracket for the eighth straight year by beating the Illini, 25-20, 25-23. In the win over University of Wisconsin II the Titans were led by the middle blocking duo of Brydon and Wagner who had nine and eight kills, respectively. Maciejewski added seven kills and Nett put down five kills and collected two blocks. Hall dished out 29 assists and totaled three service aces and Wiedenhoeft had five digs. With a tournament high 13 kills, UW-Oshkosh II rode Maciejewski in the match against University of Illinois II. Hall provided 20 assists and two blocks and Brydon had a team leading four blocks, including two solo stuffs. With the victories UW-Oshkosh II faced Penn State University II in the opening round on Saturday (April 7). The Titans found themselves leading 21-0 in the first set after the Lions showed up late for their officiating duties. After winning the stanza 25-7 and losing the second set 25-20. The Titans dominated the deciding frame 15-5. Maciejewski led the team with eight kills and Wagner added seven kills on 10 attempts. Hall had 18 assists, five digs and four service aces and Wiedenhoeft had four digs. In the semifinals UW-Oshkosh II faced James Madison University II and rode the 10 kills in 11 attempts of Wagner to post a 25-20, 26-24 victory. Maciejewski added eight kills and Brunelli tallied four kills. Hall dished out 21 assists and two blocks and Joe Vang (So. - Manitowoc), Mitch Lahmann (Fr. - Wauwatosa) and Brunelli each provided three digs. In their third time in the national collegiate club Division III national championship match the Titans stormed to a 1-0 set lead after defeating #1 seed The Ohio State University II 25-19. Faced with a 20-12 and 23-18 deficit in the second frame, the Titans looked like they were headed to a deciding third set. After a side-out by the Titans, UW-Oshkosh II received a hitting error by the Buckeyes and a solo block by Nett to inch to within 23-21. After a kill by The Ohio State University II to give them three set points, the Titans got a kill by Brydon, a hitting error by the Buckeyes and a kill by Wagner to tie the score at 24-24. Another kill by The Ohio State University II gave the Buckeyes their fourth set point. UW-Oshkosh II received a clutch back row kill by Hall and another block by Nett to give the Titans their first match point. The Titans took advantage of their first opportunity by getting a dig and kill by Brunelli to take home the title. Wagner needed just 14 attempts to collect a team-leading nine kills. Maciejewski had eight kills and Nett finished the match with five blocks, including three solo put backs. Hall again led the offense with 21 assists and came up big with seven digs and Lahmann had four digs.